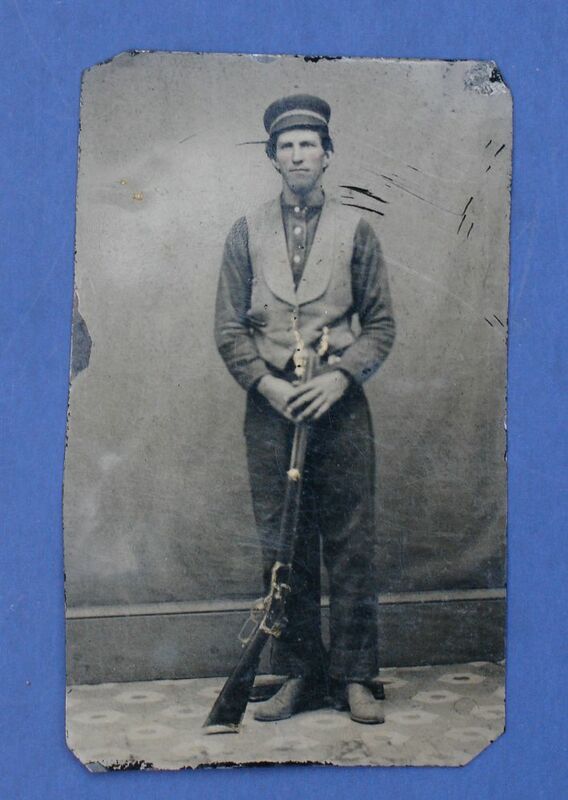 Here's a once in a lifetime photo of a hunter proudly holding his early production Model 1873 Winchester Rifle. 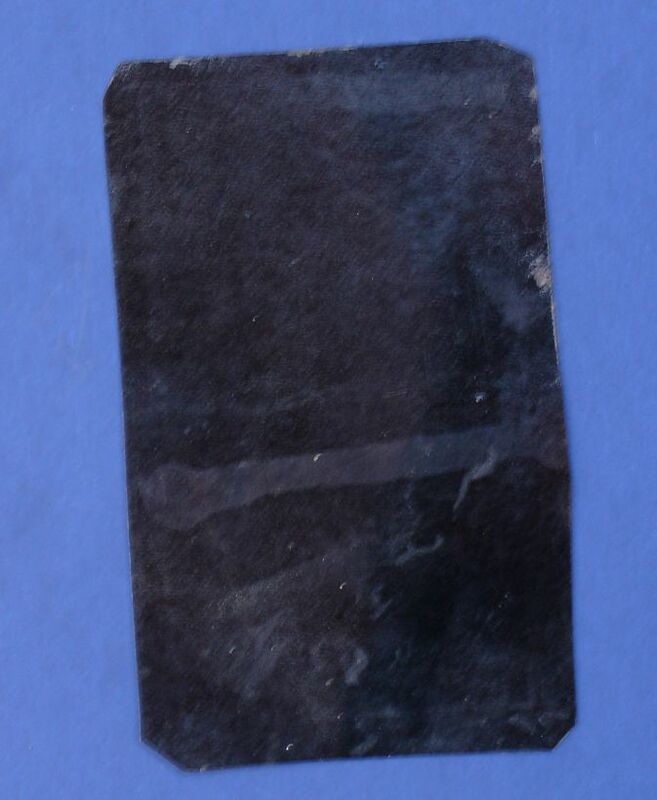 Its an 1870's era original tintype...not a repro. We don't know who this man was or any history but this did come from an older collection of images in California. 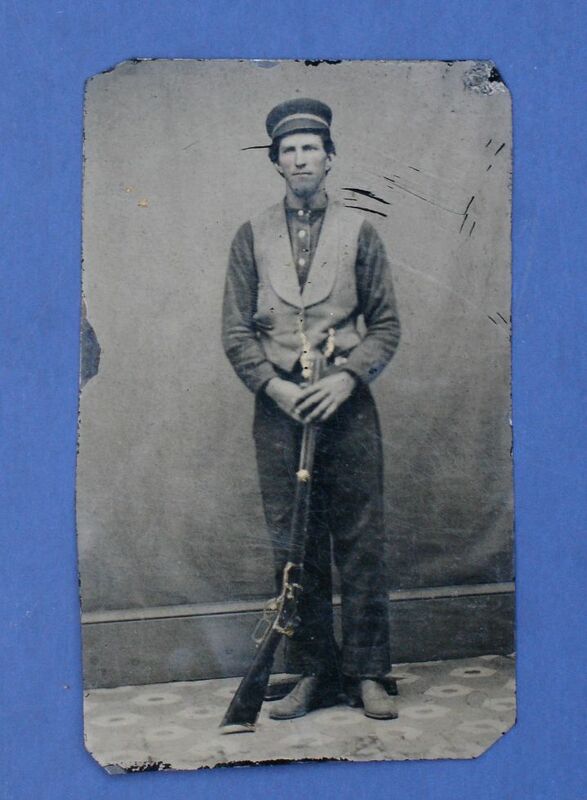 In it, you can see why this man was so proud to own this rifle. After all, the Model 1873 was regarded as one of the most advanced repeating rifles in the world when it debuted during the mid-1870's. Billy the Kid owned a 1st Model and even the Prince of Wales purchased 30 of them to be given as gifts to Royalty on his trip to India in 1875-76. You could fire it all day and reload the new center-fire shell casings with a Winchester Reloading tool and Bullet mold. This innovation was so popular, that Winchester produced over 720,000 Model 1873's from 1873-1920 with shipments all over the world. What makes this photo so special is this rifle is one of the very first ones made! The fine details in the photo are a little fuzzy but if you look closely, you'll notice the rear sight is backwards atop the barrel just in front of the frame. This feature was found only on about the first 1200-1300 rifles produced back in 1873 and 1874. The reasoning is Winchester did not possess new barrels for its new Center-Fire rifle so it used Model 1866 barrel blanks which had already been dovetailed for ladder sights. The problem was...with the dovetail so close to the frame, the new Model 1873 rear sights were simply too long to fit onto the barrel without running into the frame. Winchester solved this problem by putting these new sights in backwards with the aperture cut on the opposite side instead of the front. These first rifles also had raised thumbprint dust covers. Today, owning such an early production rifle is a Winchester collector's dream. 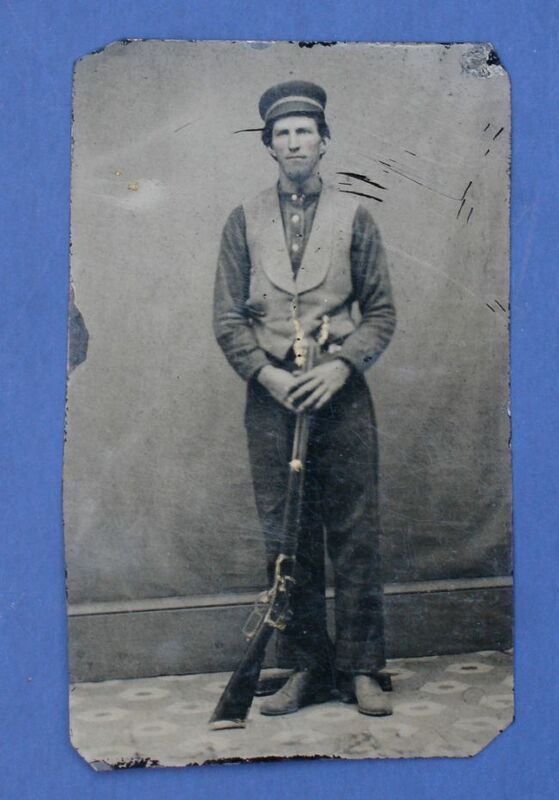 What's really rare though, is a photo of the original owner holding this type rifle in such a manner than it can be identified 130+ years later. This is a great image! For Winchesters, they just don't get much better than this!